Suitable for highly aggressive liquids—no metal parts to corrode. Three-point door latch on larger units offers secure closure and vapour control. Toe kick on under counter model allows user to stand closer to counter—less leaning, better ergonomics. 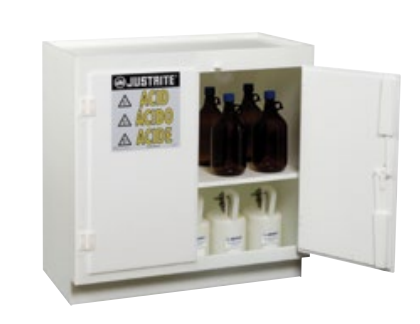 Solid polyethylene white Acid Cabinets have excellent chemical resistance to handle the most corrosive chemicals. A protective, all-welded bottom sump and a clean, sleek design complement any laboratory setting. Fully welded, liquid-tight 2-in (51-mm) sump contains accidental spills and makes clean up a snap. Shelf on larger units adjusts on 3-in (76-mm) centre. Door accepts a padlock for security.